The flower on the right was photographed in the middle of October. This plant has been in the ground for over five years and is just starting to produce a significant number of flowers. It is planted on the North side of the house, at the opening to a courtyard, where it spends most of its time in light shade. A single flower head holds on the plant and looks good for over a month because it continually opens up new flowers from the base to the nose. Flowers are also long lasting in floral arrangements. Tropical bird of paradise flowers do not have a scent. Tropical bird of paradise plants are relatively easy to grow and make a beautiful landscape plant. Being related to bananas, they have large dark green leaves that add lushness to the landscape. Large, colorful, unusual looking flowers are produced during the cooler months. These plants are also sufficiently heat and cold tolerant, so that they can be grown with little to no protection in the Phoenix area. 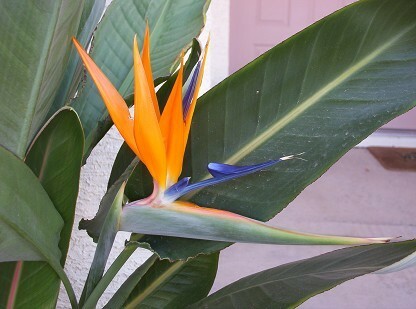 Tropical bird of paradise plants take both the lower desert heat and sun well but will look more attractive if kept in Eastern or Northern exposure. Hardy down to 24 degrees Fahrenheit, freeze damage in the lower desert and especially in the Phoenix area is not a big concern. Tropical bird of paradise plants do well on a grass watering schedule. Even though they are related to bananas, they do not get chlorotic or root rot as easily as bananas do. Unlike its banana relatives, tropical birds of paradise grow at a slow to moderate rate and therefore consume a moderate amount of nutrients. Organic methods can be used to keep it healthy and these methods can also be supplemented with small amounts of chemical fertilizers. The simplest and most effective organic fertilizer is compost which can be spread around the base of the plant at a depth of an inch. Slow release chemical fertilizers are recommended, and varieties that also acidify the soil will help the plant look greener. Plants take many years to start blooming so patience is needed. The mature size of a plant is around 4 to 5 feet tall and it is when the plant is around this size and densely packed that it starts to really produce. Heavily fertilizing the plant does not appear to hasten the onset of blooming so it is better to keep the plant healthy by supplying nutrients in accordance with its natural growth rate. Propagation is done using both seeds and offsets. See links below for more details. Tropical birds of paradise have no significant pest problems in Arizona.